When Vianne Rocher, her daughter Anouk (with Pantoufle – an imaginary rabbit) breeze into the small, religious, French town of Lansquenet-sous-Tannes with the intention of opening a chocolate shop during the holy time of Lent, you just know that there’s going to be some problems. Since Vianne is a single mother, you can imagine that the least of her problems might be her tempting confections on the town’s citizens, who are trying to deny their weak bodies. You see, Vianne believes in magic – not just the magic of delicious foods, but also in the magic of life itself, and that isn’t going to go down well with the pious mayor of the town, Reynaud, whose championing of Christianity is the village’s moral cornerstone. This is the story of Joanne Harris’ most famous book, Chocolat, which led to a major motion picture. Any book that’s made into a movie must have something about it to make it special. And any book that makes its author famous has should be exceptional. Of course, there is always a danger when reading a book before you see the movie that the movie will be a disappointment. And sometimes the opposite is also true. In this case, the latter is was what happened. It should be understood at outset that there is nothing horribly wrong with this book. Harris’ writing style is ultimately approachable and the text flows at a very comfortable pace. She neither uses overly flowery prose, nor does she go for anything too simplistic. Her use of what is now being called “magic reality” was considered innovative when this book came out, as was her introduction of extensive culinary injections into the text, which are both fascinating to read, and help the reader to escape from their hum-drum existence and become absorbed in unusual situations, despite Harris’ asking us to suspend disbelief for some of the more fantastical things that happen here. The overall feel of her writing reminds me of a wandering brook that trickles along. This can have its disadvantages, as we sometimes wish that the action in the book would pick up a bit in order to inject a touch of variety. This also means that her climaxes in this story don’t have as much of a punch as they could have. Her later novels show she’s learned how to build up to a climax better than here. Moreover, this book seems to include more than one conflict which means that she was forced to have each one come to a head separately. This made the story a touch confusing and lessened the major focus of the story. To be more specific, we have the problems of Vianne’s opening her shop in this conservative town and the reaction of the priest Reynaud, we have an over-protective mother trying to keep her son away from his grandmother, we have the bar-keeper Muscat and his abuse of his mousey wife Josephine, as well as Vianne’s own personal problems which stem from her relationship with her dead mother. Add to this the gypsies that dock at the town’s river, as well as a couple other things, and you’ve got too much going on. Of course, some people would find this makes the story all the more interesting, but I found that it just made the novel bloated. Had Harris focused on just one or two of these conflicts, and left the others to be more minor sub-plots instead of giving them almost equal weight, the end result would have been more concise and cohesive. The other problem with this novel, which wasn’t present in the movie, was the time the story is set. Harris made this into a basically contemporary setting of very late in the 20th century, but the movie moves it back to the 1950s. The earlier setting of the movie worked better for this story than the later one in the book. This is mostly because it is harder to believe that even a very small town in France would still be that fervently religious in the 1990s, but can accept this better if we look further into the past. Of course, perhaps there are still today many tiny towns in France that would follow their priest with such loyalty as to react almost totally en mass in accordance to his preaching, but it just doesn’t seem all that likely. On the other hand, Harris is able to develop her characters very fully. Mind you, if you see the movie first, the faces of the actors that portrayed these characters may get into your head while you read this. Still, this isn’t a drawback, and Hollywood didn’t make many mistakes in casting this movie. What doesn’t come out in the movie as well as it does in the book is Vianne’s mother and her history, which actually gives the reader better insight into Vianne and her motivations than the film had time to allow. It is for this reason that I’m glad I read this book, despite the other drawbacks. Remember, too, that this book is actually the first of a trilogy (followed by Blackberry Wine and then “Five Quarters of an Orange”). I personally enjoyed Five Quarters the most, and almost disliked Blackberry Wine, so this book takes second place in the trilogy for me. Still, each of these books are written to also be stand-alone stories, and you won’t be feeling you’ve missed something if you don’t read one of them or you read them out of order. 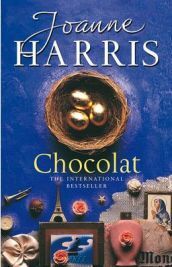 Overall, Chocolat is really a very nice novel, but not Harris’ best. Harris has definitely grown as a writer since she wrote this book, so if you want an introduction to Joanne Harris, this might not be a bad place to start. However, if you saw and loved the movie they made of this book, you could end up being disappointed if this is the first novel of hers you read. Still, it is well written, has excellent character development, a lovely style and includes innovative mechanisms that edge away from normal realistic fiction and tickles the fantasy genre. The drawbacks are the incongruous time this story is set in, too many sub-plots and too many conflicts which mean too many climaxes to the story. That makes me think that while I can still recommend this book, I can only give it three stars.